Grief is something that almost everyone will experience to some degree or another in their lifetime after the loss of a parent, partner or another close relative. Each person has to deal with it in their own way; anger, sadness, tears, withdrawal and melancholy and it leaves a lasting effect on your psyche, something that you get past, but never over. 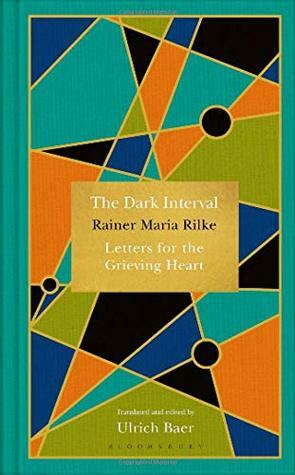 Until The Dark Interval dropped on my doormat last week I had never come across Rainer Maria Rilke, but according to the research that I have done since reading this he is a lyrical and intense poet who travelled through a number of European countries before settling in Switzerland. He was also an extensive writer of letters and the ones that comprise this short collection that he wrote to his friends and acquaintances to provide comfort and solace to them in their moments of need. They have been sifted from the vast collection of letters and translated for the first time into English by Ulrich Baer. In each letter, you hear his clear but sympathetic voice as he tries to bring the recipient back to a world away from the pain they are feeling and to use it to forge a new path back to life. There is genuine compassion in his words to all those that he writes to, and it is his words today that can still offer a much needed reassurance to those in their moments of need. I only came across Rilke last year whilst I was reading the Clara Vine novels set in Berlin before and during WW2. One of the characters enjoyed his writings and passed his copy of a book onto another character. I’m keen to read this one. It was pretty good. I have just sent it onto someone else, sorry!